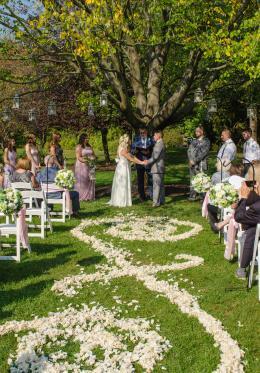 Editor&apos;s Note: This is the fifth and final story in a series of posts following the journey of Rose DeLarme and Matt Cronley, from the moment they met until that magical day when they said their I-do&apos;s. To read the couple&apos;s previous posts, click here. What a year 2017 was for us. I got to marry my best friend, take a magical honeymoon, and now we are celebrating our first holidays together as husband and wife. I’m not sure that it can get much better than this. Our wedding weekend was perfect in every way. We can not thank our vendors more for all that they did for us. The Comfort Inn in Avon was so accommodating to or guests, and Monical’s was a total hit for our rehearsal dinner! Our guests also had the most adorable gift welcome bags provided by Visit Hendricks County. They handled all 60 of us so well! It was nice to unwind in a relaxed setting the night before the wedding. The morning of our wedding day was a whirlwind. The bridal party arrived at our venue at 9 a.m.
Avon Gardens was the perfect backdrop for our photos, and we couldn’t have asked for better weather. Our flowers arrived from McNamara Florist, and they looked like a vision straight from Pinterest! 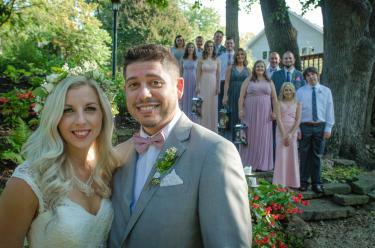 They blended perfectly with the whimsical setting we had for the day. Before we knew it, it was time to start walking down the aisle. Matt was escorted by both his mom and his dad, and I was lucky to walk with both of my parents, and have them both give me away. Our intimate wedding was filled with love, happiness, tears, and laughter. There was hardly a dry eye at one point. Our ceremony music was played by a group of students from Avon High School, and they were beyond anything I ever could have wished for. It was the perfect musical element to pull the entire day together. Sharing that moment with the people we love so much made it all the better. Tierney’s Catering, Marsha’s Desserts and Jack’s Donuts hit it out of the park! Our guests could not have said more amazing things about our brunch reception. We also had a band, Brigid’s Cross, that kept our guests entertained and dancing through literally the entire reception. Everyone prepares you for something to go wrong, and tells you not to stress if it does. We must be extremely lucky, because nothing went wrong at all. Literally our entire celebration was perfect, and it exceeded our wildest dreams! Visit Hendricks County truly made this all possible for us. Without their assistance and guidance, we would not have known where to even start planning! If you were engaged over the holidays or are currently in the planning stages for your wedding, I highly recommend including them to help you with your planning. We just can’t recommend their resources more! Our wedding day is a day we will truly cherish for the rest of our lives. Thank you all for following our journey!